Thanks to Stephen Downes for the reference to Dr. Mohamed Amine Chatti’s Knowledge Management: A Personal Knowledge Network Perspective. Knowledge ecologies are thus self-controlled and self-contained entities. Knowledge ecologies lacked a shared repertoire and are thus open and distributed knowledge domains. Knowledge ecology is a more general concept than intensional networks. In essence, a knowledge ecology is a complex adaptive system that emerges from the bottom-up connection of PKNs. That is a wonderful analysis of knowledge ecology, with a model of Knowledge Management based on Personal Knowledge Network perspective. I have once conceived that c MOOCs did exhibit the features of community and community of practice, though it certainly differed from the main features of COPs as postulated by Etienne Wenger. I reckon this knowledge ecology concept re-opens the discourse about the nature of MOOC, in where it functions and operates, and how it behaves, as a knowledge ecology at times. However, I have often noticed that MOOCs would exhibit the configuration of knowledge ecology – with networks and communities embedded in it post MOOCs. Based on my past experiences with CCKs, PLENK2010 and other MOOCs, the community is quite different from the “typical” communities that we would define, as there is no distinct boundary for the community. Instead of a community, in MOOC, it consists of numerous networks and communities which formed and re-formed, with some sustained, and some re-configuration in the network-community that formed. MOOCkers might have morphed along conglomerate networks, or social media as the weeks progressed, thus staying on with a particular media for sometime, and/or created blogs for a particular purpose, and then, engaged with others for a while. This seems to behave in a self-organised manner, without any directions from any facilitators, but then the individuals within particular networks would set their own agenda, goals, or tasks which suited their needs. Can one reveal the patterns out of these network/community formation and development? Some social network analysis did reveal the trend and pattern. How about this network and community of practice? COPs need a lot of nurturing before they could grow, develop and sustain. *Identify Potential Communities of Practice. *Provide the Infrastructure that will support such communities of practice. *Use non traditional methods to assess the value of these communities of practice. In MOOC, who will be the manager managing the COPs? May be, there is no one manager, but each of the participants in the MOOC would take up such role, and self-organise the COPs/Networks in a way that suits him or her. Twitter is a network, though not a community, as many would argue. But under the “infra-structure” of MOOC, would Twitter be re-defined differently? Is it a transitional community, or communities of practice? May be. Postscript: Here is my post on knowledge and learning ecology. I conceive new and emerging knowledge would be created through such “Global Community and Networks” which would be based on an environment, education and learning ecology with a network of learning platforms such as MOOCs (Massive Open Online Courses), MOOCs (Massive Open Online Communities) and MOOP (Massive Open Online Projects) over different spaces, network chains. Is MOOC about Community Building? I just come across this post on MOOC. So Coursera community is starting to introduce student profiles to enable students to build connections with each others. That’s a great move towards community building. There are suggestions to develop groups in these courses, and again that would surely help in supporting connectivity in MOOC. The challenge in MOOCs is: how do we know who someone really is, in their identity online? Also building groups with similar language and cultural background may help in clustering learners who speak and write the same languages, but then this would weaken the chance of those people meeting others coming from different backgrounds too. If someone is coming from a “weak” educational background, then would that hinder them from connecting with those more experienced learners with a strong educational background? ‘this MOOC is a conversation in which experts are not free to participate in expert discourse if that leads to the exclusion and marginalisation of novices’. What is Coursera built upon? Is it an elitist or egalitarian platform? That would determine how the conversation would flow, and who would be engaged in those conversations. This is also a question for c MOOC too, as experts’ interests could be very different from those of the novices. So, it is rather hard to resolve the issue – on whether experts and novices could be encouraged and supported in the discourse or conversation, by merely having a central forum in the course, where tens of thousands of students resided. Has this been a challenge in c MOOCs – where MOODLE forum was used? A definite YES. The connectivist model is more visionary in that it understands that one of the most dynamic assets of an unbound open learning system is the people, but in execution there is a lot of same chaos in identifying, absorbing, and building upon meaningful contributions. At the end of the day it is still too many voices overflowing seemingly never-ending streams. Sounds great. I suppose most of the actions mentioned are extremely useful and worthwhile to pursue, if most if not all students are coming from similar background experience, and thus with similar expectations. However, in the case of MOOC, I think it would be quite a challenge to ensure the meaningful discussion and the provision of facilitation, unless these are based on self-organising action and volunteer master facilitators who could help and support the facilitation. I also see those nuances in learning differently. First connectivist model requires an appreciation of chaotic learning, due to the interaction between different agents and information sources, and are therefore highly valuable for people who would like to master sensemaking and wayfinding, as a goal in the learning. Would that be applicable in structured courses such as x MOOCs? May be, may be not. As shared, the prescriptive learning that is based on known and declarative knowledge would not be learnt most effectively with approaches other than mastery learning, as there are definite answers that the learners are expected to respond to in assignments and examinations. Second, even in the case of peer learning and assessment, the emergent learning that emerged out of the interaction in assessment would be “structured” around a few learners only. Each of the peers need to have a certain mastery of the knowledge and skills before they could make a “valid” and reliable assessment of their fellow peers. This is similar to the peer-review in articles for publication in journals or conference, only that the review here is related to certain course work, rather a formal paper for publication. To achieve a mastery of skill in vetting and grading peers’ assignment required mastery of assessment too. This might require certain “validation” of the skills before one could take up such assessment role. Under a formal structured course of instruction, the instructivist approach seems to be the norm rather than exception, in endorsing and assessing the learners to peer assess. If one wants to know whether the responses in assessment are meeting the standards set up by the education authorities or professors or not, then such assessment has to go through another assessment process – like auditing or peer-review by experts. How would this work in x MOOCs? How about the cheating and plagiarism issue that are challenging the Coursera? Are these also part of the learners’ roles to check and report while assessing their peers’ work? The peer assessment, however, may best be approached with a connectivist approach, provided any suggestions to improvement and development are co-created in an educator-learner environment. This is both a challenge to the professor, and to that of fellow learners, who might have believed that chaos in learning is undesirable, thus causing frustrations among learners, who would then drop out of the course, without any raising of the concerns. In summary, building community to approach learning in MOOC would surely be the way to go, when all those learning are happening in open space, rather than the limited closed space in forum or videos instruction. There are however challenges which still need to be resolved, when language barriers, chaotic learning, peer assessment and cheating and plagiarism issues are emerging out of the MOOCs. Postscript: Cheating has become a huge concern in Higher Education. See this post. Here is the post relating to the language and peer grading issues. 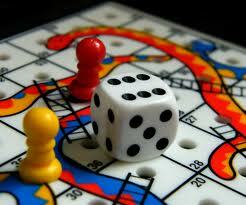 Gamification – Is that the strategy that will lead you to the promised land? 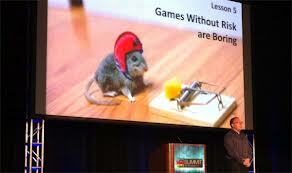 Gamification: that involves applying game design thinking to non-game applications to make them more fun and engaging. 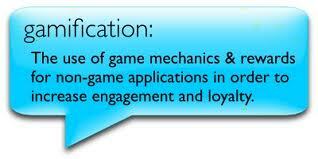 Gamification has been called one of the most important trends in technology by several industry experts. Gamification is a strategy which has its precursors from the Soviet Union’s involvement of workers at work with games and experiments and USA’s various management approaches, with a sense of childhood’s play, to weaken the split between work and play. Such strategies have also been widely used in the design of multi-media games for entertainment, which engage the game players with “playfulness” and fun. Gamification sounds novel to education, and has not been widely applied as yet. However, if we treat education as a business entity, then why can’t education be gamified? As cited in wikipedia “Business applications for gamification are just beginning to appear as well. RedCritter Tracker incorporates gamification elements such as badges, rewards, leaderboards and ribbons into project management. 3. Leverage external motivators – with game, and Alternate Reality Game. Integrate these games into classroom activities, tasks and projects, and you would have a class of students ready to share ideas, using games-design to approach problems, or to explore ways to solve real problems, or taking up an adventure. I could imagine that within a few years, there would be a plethora of gamification in education and learning, when badges become the norm in recognizing those learners who have achieved certain levels of “capability” or competency in networked learning, or in building networks for collaboration and cooperation. The Google document, wiki, Google Hangout, and Blog collaboration could also be part of this gamification, in search of new knowledge or adventure in emergent learning. The recent x MOOCs could all be “badged” to recognize the learners too in their “levels” of involvement and engagement, though it is still too early to come up with a model that would gamify the whole x MOOC business of education. It’s really up to your imagination to engage and involve both learners and educators in education in this exciting network of learning, and gamification could be an important strategy both for the institutions and educators to employ in getting the learners on board and be engaged, with fun. If you are looking forward to the promised fun land, isn’t gamification the way to go? 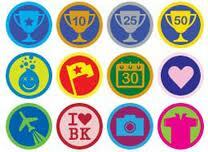 How have you used gamification in your field of work, or education? Roy reflects on the significance of MOOC in this post on MOOC or not MOOC. Yes, that’s resonating. Enriched conversation in MOOC would help in binding people together, to form into peer groups. Roy, Jenny and I have since formed such a research group post CCK08 and in CCK09. I have also joined or created groups with many others since then in various MOOCs. 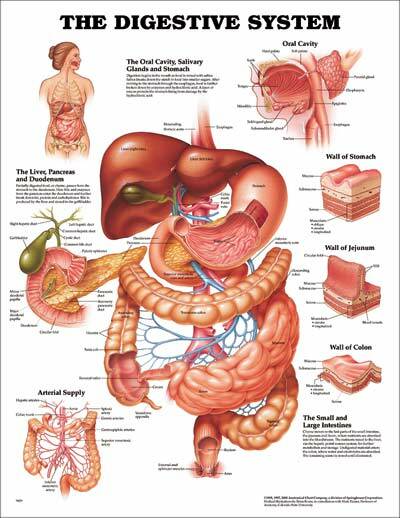 I think the formation of such peer groups on various basis – like the ad-hoc ones for the preparation and presentation in CCK09 – with Francis Bell, Ken Anderson, Jenny Mackness, Heli Nurmi, Eduardo Peirano, Ailsa Haxell, Roy Williams and I etc. are examples illustrating the importance of small groups learning in MOOC. I also think such activities provide the breeding ground for developing a Network of Practice, in its loose form, despite the weak ties. Such groups also allow for individual autonomy whilst supporting each others to develop interests in further connections. What make me think in our community? To me, the nuance in how we know and learn make me think. The recent video teaching and x MOOCs prompted me to explore further about what it means to learn and communicate in our learning community. What about the discourse on video teaching? Here in a competition critiquing Khan Academy. I think this video captures the essence of why education hasn’t been that successful with those video teaching only. First, teaching followed by practising what has been taught sounds a good-practice approach, but what if the problems are different from the ones taught? How would the students deal with such problems? There are plenty of videos using similar approaches in teaching. What would I suggest as alternative models? If we were to “teach” probability, there are many different ways. One of the ways involve producing a video, such as the one as shown. Instead of introducing “symbols” and tree diagrams first in the video, I would use actual coins and dices to show to the students what actually could happen for each combination. This could demonstrate the concepts behind probability. I would then let the students experiment with an activity, where they could come up with each combination, in order to draw up with conclusions about the chances of each combination. I could then use a tree diagram to summarise the different combinations, as reported by students. The students would also have to apply such concepts of tree diagram in different applications, through wiki or actual real life projects or activities, to reinforce their learning in probability. A final project presentation by a group of students would then be used to summarise their learning, and to share with other students in the class or community. I should have used a video to illustrate these. That would be another interesting project to work on. How about the current trend in x MOOCs? – The course forums are relevant as everyone is tackling the same material. – There is a lot to be said about human psychology and motivation. Presence of deadlines makes you more likely to meet them, and lowers the chances of you falling behind forever and never catching up. Many people going over the same material at the same time produces more excitement and increases engagement. The underlying assumption of university education — at least at major research universities (as Stanford is) — is that the principle value for the student comes from studying with a world expert in a particular domain. Though many professors at research universities do in fact put enormous effort into their teaching, what is really being offered (sold) to students is the expertise (and reputations) of the faculty. (Other parts of the value proposition, such as the prestige of the university, stem from the faculty, both past and present.) It’s a method that works well for very bright, well-prepared, and highly motivated students, but it is not ideal for everyone. If I were to use the concepts here on social media and social networks, what is critical to mass education and personalised learning is NOT education media but education and learning networks. This comprises of clusters of education and learning networks, communities, community of practice, where the learners, educators, networkers are engaged, interacted, and connected. So, it seems that our current trend is not just to “reproduce” content masters, based on content mastery methods – like mastery learning. What truly revolutionizes education, is to build the connections, the bridge in between these education and learning networks, so learners and other learners, educators, and many other experts could immerse in the communities, in developing and becoming who they would like to be – a master of connections, a master of content and a master of thinking and learning etc. This requires a shift in the paradigm of knowledge, or new knowledge that is needed to emerge out of networked and formal education and learning. What sort of learning theory and practice would stand the test of time? Kuhn argued that a scientific revolution is a noncumulative developmental episode in which an older paradigm is replaced in whole or in part by an incompatible new one. But the new paradigm cannot build on the preceding one. Rather, it can only supplant it, for “the normal-scientific tradition that emerges from a scientific revolution is not only incompatible but actually incommensurable with that which has gone before.” Revolutions close with total victory for one of the two opposing camps. How to ensure a support of a paradigm shift of knowledge? Communication in electronic environment needs coordination and management. This is especially important if we would like to have a community where members are communicating and learning within networks of communities, and thus be responsive to the changes in the learning landscape. This requires learning going beyond classrooms. Theory practice learning underpins: “take a THEORY you learned in a classroom, put it into PRACTICE in the local community, and after a period of reflection and analysis, a deeper LEARNING will be the result. Is learning community the solution? In theory, yes. “Learning community do not represent a “magic bullet” to student learning. Like any other pedagogy, there are limits to their effectiveness. Some students do not like learning with others and some faculty find collaborating with other faculty and staff difficult.” Vincent quotes the findings from Cross, 1998 that there is evidence to support their application enhances student learning and persistence and enriches faculty professional lives. In conclusion, there are many approaches in learning, where the current methods of videos teaching (with flipped classroom), or MOOCs are just part of the education trend. What truly revolutionizes education would likely be based on the shifting of education media towards education networks (and community). Such pedagogy would involve building bridges towards to the becoming of a master, be it a master of connection, master of content, or a master of thinking and learning. 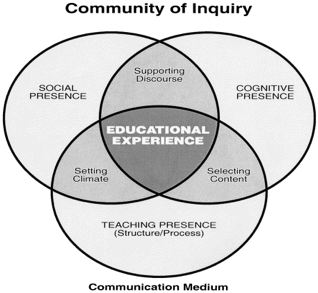 A learning community would support the learning of students and educators, when there are suitable frameworks built and developed. How would you measure the success of learning within such learning community? When there is a learning community emerging from the education institution or learning networks, where learners could recognise the nuance between their personalised learning via PLE/N and the formalized learning via LMS, and choose the learning that fits into their changing needs and expectations, and most important of all, that would support their fulfillment of personal passions. Postscript: See this post on Community of Practice. Are we designing education for people? An impressive talk here on TED by Timothy Prestero. Timothy thinks we need to design for manufacture and distribution, actual use and appearance. Timothy posted a number of questions: Are we designing for the world we want? Are we designing for outcomes? I think this concept of designing for outcomes could equally be applicable to the design of education and learning in our world? What sort of design would we need in our education system? Is it an open or a closed education system or a hybrid education system? I think education could be categorized under an Open or Closed System, and that under an institutional model, the closed system would likely be run based on good to best practice, whereas the open system would likely be run based on emergent to novel practice. What skills and literacies should be included in the course curriculum in HE? The skills and literacies that higher education institutions are aiming to include in the course curriculum may include: creativity and invention, global awareness, critical thinking and problem solving, information & technology, collaboration, cooperation and communication. How are strategies deployed to design, implement and develop the course curriculum? Most formal institutions have been structured on a planned structure and curriculum, with planned strategies originating in formal plans: precise intention exist, formulated and articulated by central leadership, backed up by formal controls to ensure surprise-free implementation in benign, controllable or predictable environment; strategies most deliberate. With a formal education system, such planned strategies are ideal for content delivery, where knowledge is “transferred” from educators to learners, and that is where instructivism would be the ideal pedagogy. Good to best practice in teaching would further be based on structured course design, mastery learning, evaluation and feedback model. The introduction of online distance learning in the recent x MOOC movement however have shifted the learning towards an “open” yet massive model of education, with a possibility of emergent learning as educators and learners are now learning via the open web, on top of the closed LMS (Learning Management Systems) provided by the institutions. A different set of strategies from the deliberate strategies seemed to have emerged, and this may significantly influence the formal controls that are required to run the MOOC in a cost effective and efficient manner when the courses are open to the public free of charge. Here the entrepreneurial strategies have been considered and adopted: such strategies originate in central vision, intentions exist as personal, unarticulated vision of single leader, and so adaptable to new opportunities; organization under personal control of leader and located in protected niche in environment; strategies relatively deliberate but can emerge. The emergence of x MOOCs revealed that emergent strategy does not have to mean that management is out of control, especially under an institutional learning ecology, only that it is necessary for the institution to remain open, flexible and responsive to the learners’ needs, in order to thrive in developing courses aligning to the changing needs of society and learners. The institutions are drawing a clear line between the x MOOCs and courses formally delivered in the institutions as mentioned here, so they could still maintain control over accreditation and award of qualifications. All of these MOOC platforms appear to justify their status by promoting curricula that are equivalent to campus-based courses, with a strong focus on content delivery and an emphasis on the rigor and formality of their assessment methods. However, some of the most interesting and innovative practices in online education have emerged by challenging these very ideas; loosening institutional control of learning outcomes and assessment criteria, shifting from a focus on content delivery to a foregrounding of process, community and learning networks, and working with more exploratory assessment methods – digital and multimodal assignments, peer assessment and group assignments, for example. In summary, most institutions are still running with deliberate strategies (with good to best practice) rather than emergent strategies (with emergent to novel practice). I don’t think institutions would want surprises or failures. However, it is likely to happen in x MOOCs, when there is lack of “motivation”, skills, time among the learners to complete the course. This could be an issue especially when dealing with large number of dropouts, lurkers, or even learners who may not meet the standards required to complete the course. That seems to be the challenges facing institutions when running x MOOCs alongside their mainstream courses too. What are some of the latest initiatives in MOOC? This sounds interesting as it is automating the MOOCs with a “mechanical base” with minimum intervention by the “instructor”. This seems close to the idea of Robot Professor as mentioned here in Singularity University upgrade. University of Maine PI launches open learning initiative. A learner organised MOOC spins out of MITx has likely caught the institutions by surprise. What sort of pedagogy are involved in a closed and open system? Jon provides a wonderful summary that contrasts between the connectivist (c MOOC) versus constructivism (task, projects, activity based MOOC) versus instructivism (x MOOC, like Coursera, Udacity, edX etc.). What are the merits and limitations with each pedagogy? See this post on three kinds of MOOCs by Lisa Lane. Refer to this post on pedagogy and challenges of MOOC. What are my outstanding questions? (a) For c MOOC or x MOOCs, whether such practices are preparing or aligning people to certain “becoming or being” practice – such as Network of Practice (Another term to COP). For those past MOOC participants (who have been practising as core (active learners) and LPP (legitimate Peripheral Participants), or lurkers in the initial MOOC – CCK08), they might have acquired experience and knowledge of what it means, and how it works in a typical c MOOC. For novices who have little experience of active learning in the core of MOOC, due to factors like (lack of motivation, knowledge, skills, time, confidence, or having a negative views on “experts” or educators etc. ), then they may either remain as LPP, lurkers, inactive participants, or even leaving the course. What sort of intervention would be helpful in supporting novices in a MOOC? Would learning analytics help? (b) Whether certain content or knowledge are required to be able to participate and engage in the MOOCs, and if so, what are they? In a typical traditional course, there are specific learning outcomes and so pre-requisite knowledge and skills are required in order to complete the units. This may include certain forms of literacy, like reading, writing, and interpreting in certain language (English, if that is the principal media). In a MOOC where such pre-requisites are non-existent, or not clearly stated, what and how would participants (and learners) know that they haven’t got enough pre-requisite knowledge and skills in doing the course? Would a pre-assessment or self-assessment prior to doing the course help? (c) Whether connectivist or instructivist learning through MOOCs is meeting the participants’ needs and expectations. This is mainly because many participants (educators and learners alike) were educated based on an instructivist pedagogy (i.e. expecting certain levels of teaching by the instructors, or even spoon feeding for those who are “illiterate” or “well below the level of standard” required to learn the materials themselves). What is the reality, especially for those learners who have negative experiences in school, and so were not equipped with the skills and knowledge in learning? This also applies to those coming from a different culture and are new to the “language”, and thus find such environment very intimidating, or even scary. My experience is that some students wouldn’t like to express themselves openly, as they might be afraid of making mistakes, and would even be laughed at, if their ideas are perceived to be overly imaginative and unrealistic. I know what it means and how it feels, as I had such experience when I was a learner in high school. Where would learners coming from a disabled or disadvantaged background, or those learning the subject as a foreign language get their help and support in MOOCs? (d) Whether MOOC should be designed with an “egalitarian or elitist” or a hybrid of both in principles, and be based on meritocracy. Surely the x MOOCs are encouraging and supporting elitist principles when the “star” graduates are promoted in their courses. How about the other participants who are participating in the course? May be they are just another dot or node in the network, or even anonymous. How would these participants perceive the course? What are their motivations? Who would care whether they have contributed or consumed the course materials or not? (e) Whether MOOCs are open or closed, as it seems that x MOOC are copyrighted with their materials, and so there are lots of challenges when participants are posting any comments, or remixing any contents or posts, as that could be an infringement of copyright. (f) What are the basis of x MOOCs? In the x MOOC, it is based on meritocracy, where students who achieve with good grades in the course would be rewarded with the “achievement certificate” and may then be recommended by the course organiser, like Udacity, for a job. Has MOOC become the game changer in higher education? Yes? Would Online education replace college education? Not yet, as the author argues. Here is my recent post that relates to the challenges and issues of x MOOCs. There are concerns about quality of the courses developed, as highlighted in this post relating to the cancellation of a course with Udacity. Finally, What is the goal of education? “The goal of education is not mastery of subject matter, but of one’s person.” We need a deep approach to learning, not a surface and or strategic approach to learning, especially in our goals of higher education. That will also require a new paradigm of knowledge. 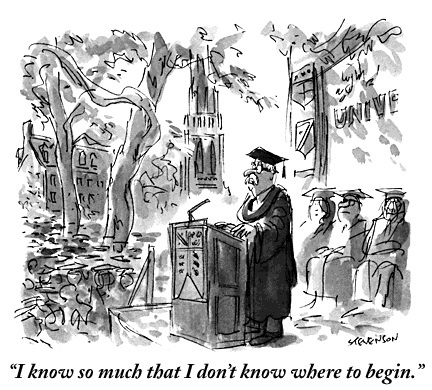 Are we at the crossroad in Higher Education? Are we designing education for people? Let’s wait and see. I would like to respond to this learning points on MOOC – where it concludes that MOOC are failures and will be a failure. Generally, a good coverage of the issues, challenges of institutionally based MOOC, and what might be outcomes when MOOCs are introduced into formal systems in an institution. I could see the concerns and difficulties that are confronting both administrators, educators and even the learners when adopting a MOOC as a platform to drive educational reform. I agree that some of the issues are very hard to address, like cheating and plagiarism, and identity of the learners. Other issues relate to the lack of skills and pre-requisites required from the participants in doing a formal MOOC (i.e. x MOOC, like Coursera or Udacity). These are challenging for administrators, educators, designers and learners, when working and learning with MOOCs. Finally, may I put these into philosophical propositions? 1. When you don’t see any rigid structure in MOOC, that is good, as MOOC should be personalized, having adaptive and amorphous structures that are all customized to suit the learners, not just the educators needs. 2. When there seems to be a chaotic structure in place, that is good, because such structure would challenge even the most intelligent and talented educators, scholars, professors and learners to sort them out, so everyone has to rethink and reflect about what it means to learn in a chaotic Web and internet based learning environment. That is the reality that we are facing, in times of flux. 3. Where there are more and more problems emerging out of MOOC design, delivery and development, that is good, because this would give a chance for scholars, researchers, administrators, educators, and learners to change and adapt their teaching and learning, based on a shift in the pedagogy, paradigms. This would challenge each of them to re-think about the importance, significance and implications of online participation (with a participatory culture), collaboration and cooperation, as a network, as a cluster of educators, researchers, and learners throughout the global networks, as an institution, or a partnership of institutional networks. This would stimulate and promote stakeholders to research, to learn and to improve and innovate altogether, in order to tackle the challenges ahead of us and that of our next generation. That is the change and transformation needed to keep abreast of knowledge and learning in an ever changing world. 4. 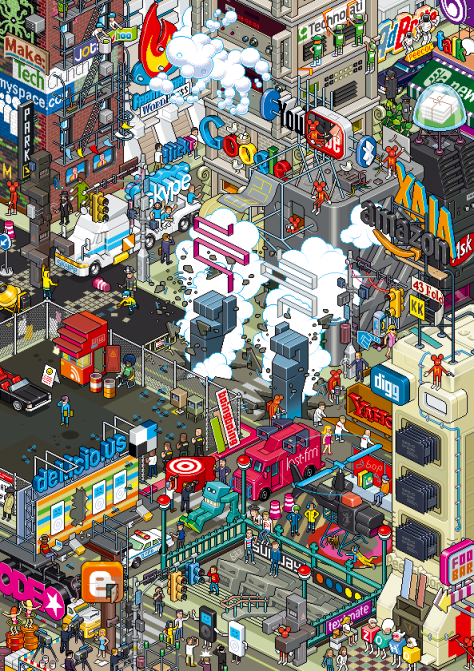 Are we living in an era of disruptive digital media based ecology? The challenge is huge, but the reward is even bigger. The more we know, the more we know that we don’t know. And that is learning as growth and development, both individually and as connective and collective wisdom. This is the time to celebrate the successes and failures, through experimentation, and possible failures of MOOCs, where educators and learners could learn together. Without trials, we never learn. Treating MOOC as a driver to education carries certain risks. Are we safe-fail or fail-safe when designing and implementing MOOCs? What are the lessons we could learn from such x MOOC AND c MOOC that would help us in transforming education, both informally and formally, under institutional settings? I have argued in previous posts that there are only success pathways that HE could afford to cross and chart out. It is equally important to realize that such pathways do carry costs, and need careful planning in its emergent design and implementation. There could be failures at certain points of implementation of MOOC, and that could be part of the whole learning in an internet based digital learning environment. These relate to the pedagogy and Netagogy adopted in the MOOCs. Is that also why online education had been withheld from the mainstream for the past two decades? Only innovators and pioneers dared to try to design courses to cater for the learners’ REAL needs. But without such endeavour, we would soon be retracting back to the basic, traditional and fundamental course of delivery, relying heavily on mass lectures, tutorials on a face-to-face scenarios, and a close of the four walls to ensure safety and security. Openness is a rhetoric rather than reality, when introduced in the on-line educational courses, and that is where we could foresee in the coming future. Are we at the crossroad in Higher Education? Are we going to the future, or back to the past? That’s your call! Postscript: What might be some solutions? Here are some suggestions from my previous post on Future of Education.